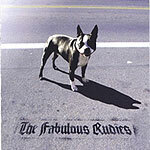 CD review: "The Fabulous Rudies"
This review first appeared in the July 20, 2006 issue of the North County Times. A dance band? A message band? Just what is Oceanside's The Fabulous Rudies? Seemingly wanting to be both, the Fab Rudies combine a ska-drenched back beat with uptempo dance rhythms and then couple both to earnest political lyrics. Which obviously can work  witness U2. Great party band, lyrics heavy enough to chew on for awhile. But context is everything, and part of the challenge facing The Fabulous Rudies is that they're a local, part-time band  and, like most local bands, they're mostly playing local clubs. Now, just how many people go to a club on the weekend for a couple drinks and a political lecture? Or maybe "Free North America" isn't really an anti-Bush diatribe, but instead is mocking those bands that take themselves too seriously. It's (seriously) kind of hard to tell. Especially since the previous song sings the praises of actor Richard Gere, tongue apparently planted firmly in cheek (or not ... it's, again, kind of hard to tell). The dance part works much better. The sun-soaked rhythms and tight horn charts recall Ozomatli or Madness. The musicianship is pretty solid, the songs' melodies pleasant. And regardless of the message half of things, the great music is reason enough to check out this release.